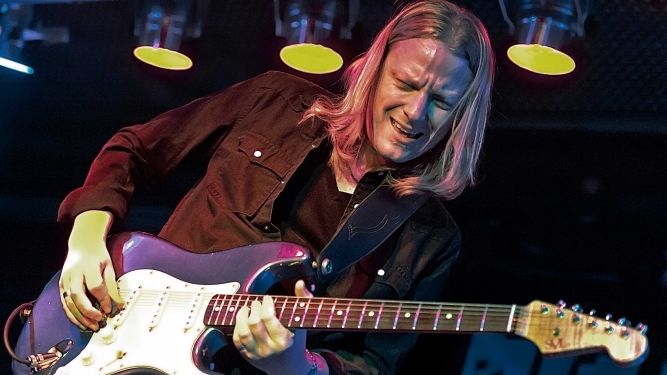 Though he holds a British passport and is an inductee of the British Blues Hall of Fame, Matt Schofield has been making his mark globally as one of the top players in the new class of six-string wunderkinds. Now, he's back at Groove Now after his first show in 2010. The Los Angeles Daily News wrote, "In Schofield, the UK has produced the best Blues guitarist from any country in decades... head and shoulders above the herd", while Guitar & Bass Magazine rated him in the top ten British blues guitarists of all time, ranking him with icons Eric Clapton and Peter Green. Born in the industrial city of Manchester and raised amongst the rolling hills in locked-in-time Cotswolds, Schofield began playing guitar at the age of 12. At age 18, he left the countryside and moved to London. There, as a sideman, he was able to hone his skills, backing a great variety of experienced and well-known artists of the British Blues scene, visiting American artists, as well start touring internationally. The introspective, well-read (lover of science, history, and philosophy) and passionate Schofield said, "this enabled me to stay close to my roots while learning my trade and exploring a variety of musical frontiers." "By age 25, I was starting to explore my own band projects. Although my formative guitar influences are largely the old-school blues players, I never wanted my own music to be constrained by a rigid formula, or even genre. I just want to play 'Matt Schofield music'. Classic Jazz, funk, soul, and rock, and all the music I love have all found their way into it. The process of writing and singing has become increasingly important to me, and I feel it?s those other aspects of creativity that helped define my own voice on the guitar. It?s always been important to find a context for the guitar to be part of, so that it's not just guitar solos for their own sake." "I remain a music lover first and foremost. The recognition I've received from both fans and peers is humbling and inspiring, and those 'pinch me' moments, where I found myself trading licks with heroes like Robben Ford and Buddy Guy, are still the biggest thrill." "Now after five studio albums and a solid 10 years of touring with my own band, I have definite broader concepts I want to explore. Remaining open to where the music might take me while maintaining the excitement that improvising and collaborating with talented musicians allow, is key to me. My inspiration and goals came from many places: My influences old and new, including musicians I have wanted to collaborate with for years. Things I still feel I hadn?t fully realized on previous studio records, and a need to keep pushing myself. It all meets at the place where I?m heading now. I?m always aiming to go as far as possible to capturing the same connection with the listener that I aim to make at a live show or on record. That?s the goal. Capturing that special moment. ?